Renowned American classical violinist Christina Castelli has distinguishing herself as one of today’s most dynamic soloists. She has garnered international acclaim for her compelling concerto and recital performances throughout the United States, Canada, Europe, and South America. Ms. Castelli has been a featured soloist with many of the world’s most revered orchestras, including the Cleveland and Minnesota Orchestras, the Chicago Sinfonietta, and the Atlanta, National, Seattle, Colorado, Pittsburgh, Nashville, New Jersey, and Alabama Symphonies in the United States, and the Belgian National Orchestra, Royal Chamber Orchestra of Wallonia, National Orchestra of Colombia, and Chilean Regional Philharmonic overseas. As a recitalist, Ms. Castelli has appeared on concert series in nearly every major city in the United States, and has been presented in such prestigious venues as Carnegie Hall, where she made her critically hailed recital debut in 2004, La Monnaie Brussels, and the Ravinia Festival, Chicago Cultural Center, and Kennedy Center for the Performing Arts. 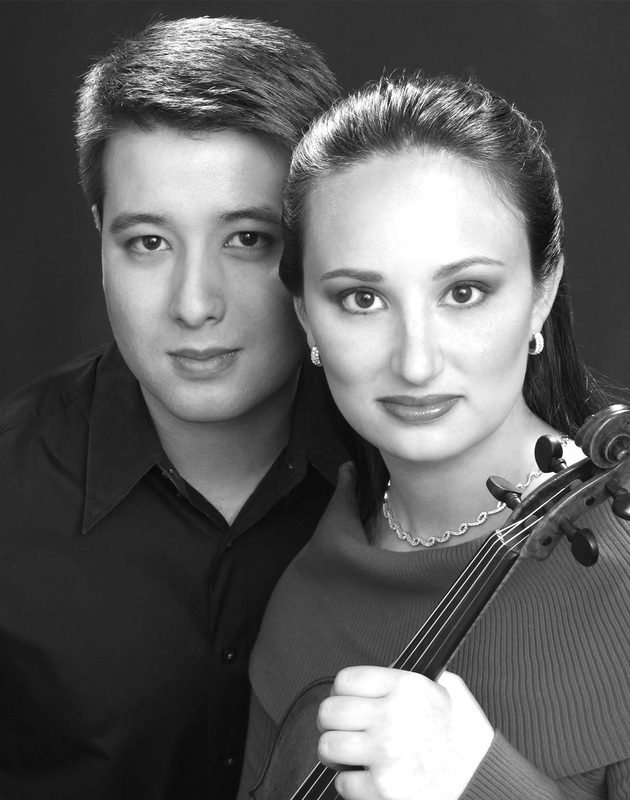 An avid chamber musician, Ms. Castelli has appeared as soloist with and leader of the International Sejong Soloists chamber ensemble and as concertmaster of the Metamorphosen Chamber Orchestra in addition to giving chamber music performances on both violin and viola throughout North America, including numerous concerts at the Vancouver Chamber Music Festival in Canada. She has been heard as a soloist and chamber musician in live and recorded performances on radio stations around the globe, including National Public Radio, CBC Canada, WCLV Cleveland, WQXR New York, WFMT Chicago, Vermont Public Radio, Caracol Colombia, RBTF Radio Brussels, and UCV Chile. Ms. Castelli has received international recognition for her powerful performances. In 2001, she was named a Laureate of the prestigious Queen Elisabeth International Violin Competition in Brussels, becoming the only American-born violinist granted the distinction that year. Ms. Castelli was also named a Presidential Scholar in the Arts by the White House Commission in 1996 and received a gold medallion from President Bill Clinton in Washington, D.C. In addition, she has been awarded first prize in numerous competitions, including the William Primrose International Viola Competition, Juilliard Concerto Competition, Sphinx Competition, California International Young Artists Competition, Holland-America Music Society Competition, and National Federation of Music Clubs Competition. A passionate advocate of music outreach, Ms. Castelli is committed to sharing music with others through active learning experiences. She frequently gives presentations to children in metropolitan public schools through her Community Music Commitment (CMC) Program and conducts master classes for violin and viola students. Ms. Castelli is also active in outreach programs abroad. In the summer of 2007, she traveled to Tunisia, Africa, as part of an outreach program to learn about music native to the country and to share Western music with communities in the capital city of Tunis. While in Africa, Ms. Castelli presented master classes, provided private music instruction, and performed both Western and Tunisian music with musicians from both backgrounds. Through these outreach experiences, Ms. Castelli hopes to lend even more momentum to the music community, encouraging others to make a concerted effort to share their passion for music whenever possible. Born in a suburb of Chicago, Ms. Castelli began studying the violin at age three with Edward Kreitman, later continuing her studies with Roland and Almita Vamos. She earned her bachelor’s degree with honors in chemistry from Harvard University and her master’s degree in violin performance from The Juilliard School, where she studied with Dorothy DeLay and Rohan De Silva and received the Samuel Gardner and William Schuman prizes. Ms. Castelli currently resides in the New York City area with her husband and three daughters. Ms. Castelli performs on a violin crafted by Giovanni Grancino of Milan in 1709. Collaboration is a significant part of my musical career, and I spend a great deal of time with my recital partners, students, and other musicians with whom I enjoy playing chamber music. My collaborating partner for recitals is most often Grant Moffett, a wonderful pianist who has endless technical ability and musical instincts that are very similar to mine, which is why we agree so much of the time about musical phrasings. He also happens to be my husband, so it is a very convenient collaboration, as well. Grant and I recently recorded a CD together, entitled “Romanced,” a challenge we both enjoyed enormously. I am also fortunate to have the opportunity to play quite a bit of chamber music on violin and viola. I have several different groups of people with whom I frequently perform. I am especially fond of string quartets and had the pleasure of being coached by the St. Petersburg Quartet for a year. One of my greatest passions is teaching. Due to my hectic schedule, I only teach a select number of students, but those students receive my undivided attention during weekly, bi-weekly, or bi-monthly lessons. If you are a student or adult who have a question about studying music, playing violin, or performing, feel free to email me with your question, age, name, and hometown. I will occasionally post my responses to your questions in my journal , and if you have specific questions that would be more appropriately answered by email, I will do my best to reply to you personally. 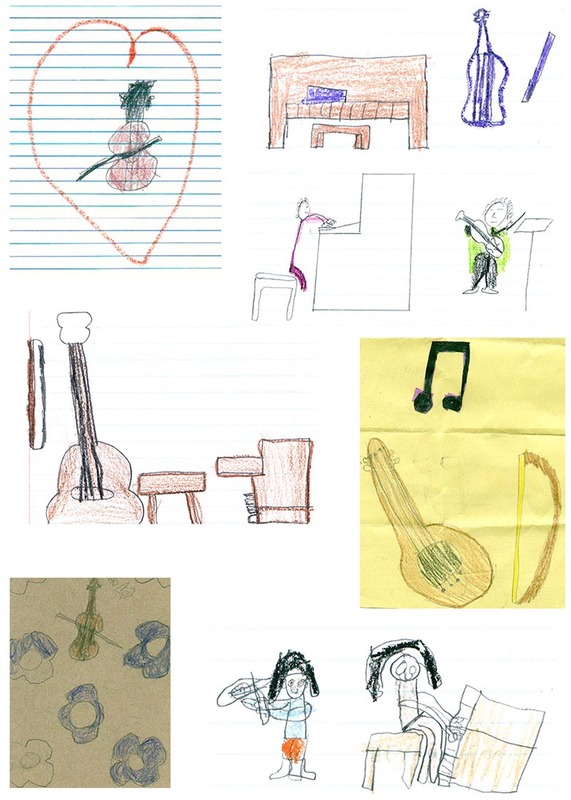 Students who have drawings that they would like to submit for possible posting in my outreach section may email their drawings to me or hand them to me after a concert, along with their name, age, and hometown. Not until after one attempts to teach a given subject can one fully gain appreciation for its learning obstacles. I began to play taking violin lessons when I was three years old with a wonderful Suzuki teacher named Edward Kreitman. Mr. Kreitman was just starting his teaching career when I began studying with him, and his music school – the Western Springs School of Talent Education (WSSTE) — has since become a large and important one that is known to musicians nation-wide. Mr. Kreitman showed me how crucial it was to have a wonderful teacher from the very beginning: he insisted that I always play with the correct bow hold and stance, that I listen to every sound that comes out of the instrument to make sure that it is beautiful, and that I push myself to excel while remaining careful and thoughtful of what I am doing. These are a few of the fundamental guidelines I have relied upon to grow as a musician. I then spent nearly 12 years studying with Almita and Roland Vamos. They are inspiring teachers who encouraged me to follow my musical instincts and search for subtle nuances in every piece of music that I play. The Vamoses celebrated exciting moments of success with me and helped me move forward after moments of disappointment. After studying with the Vamoses, I took two years to work on my own, without a teacher. I used this period of time to grow as an interpreter of music and to really carve my own playing style. During this time, I remained focused on learning new repertoire and on fulfilling concert obligations. Finally, I finished my studying with Dorothy DeLay and Hyo Kang at The Juilliard School in New York City. I was eager to become acquainted with New York and all of the exciting musical opportunities that abound there, and the experience was made even more enticing by the chance to study with the legendary violin teacher Dorothy DeLay. When I arrived to study with Miss DeLay, she had over 100 students in her studio. Three of us had the privilege to be full-time students of hers, and I spent the first several months that I studied with her adjusting to her teaching style (much more hands-off than I had previously experienced), asking questions, and learning as much as I possibly could from every comment and observation that she made. When Miss DeLay became ill, I contacted Hyo Kang, one of her teaching assistants who had a full studio separately from her, and asked him to take me as a student, which he graciously did. Mr. Kang and I worked together for about a year, until my graduation from the master’s degree program at Juilliard. After having studied with so many incredible and vastly different teachers, I feel I have a great deal of ideas to share about playing the violin and interpreting music. I have been teaching since I was a teenager, and it is one of the most important ways that I can give back to the community what the community has given to me. My studio consists of a small handful of young, talented violinists (and occasionally a violist or two!). Due to my concert schedule, I schedule lessons weekly, bi-weekly, or bi-monthly, depending on the student’s needs and abilities. Often times, my students will work with me in conjunction with another teacher, to gain additional feedback and to have another teacher with whom to work when I am out of town. My teaching style focuses on an extremely strong technique, clarity of sound, memorization and retention, and developing a musical personality and style that does not mimic recordings but that is well-suited to the performer. If you are interested in taking violin lessons with me, please email me with your name, age, contact information, background, and playing goals. I am currently working on a guide for students on efficient learning methods – a book inspired by my late teacher Dorothy DeLay, who often stopped during a lesson or master class to ponder why some students are able to memorize and perform with ease while others, who are just as technically and musically proficient, are not. Below is an excerpt of the guide, which I hope students will find useful as they strive to learn. “Efficient learning is almost singularly achieved through efficient practicing; this is true in music as well as in athletics and academics. Violin playing is an art, and it must be rehearsed countless times in private before it is displayed for the public. There is an art to practicing, then, and those who achieve the greatest results in minimal time have indeed perfected the art. I consider outreach to be at least as important as any concerts I play. I am committed to bringing classical music to diverse communities and have been conducting community outreach programs for nearly a decade. In 2004, after several years of delivering performances as a professional violinist, I increasingly noticed the chasm growing between musicians and music organizations, and their communities. At a time when local communities’ government funding for the arts was being decreased at a seemingly exponential rate, I felt it was necessary to reach out in any way possible to expose underfunded communities to classical music. My immediate answer to this need was to launch an initiative called the Community Music Commitment (CMC) Program. This program became a vehicle through which to reach communities of people who normally would not be able to afford the cost of a concert ticket and whose children had likely never heard classical music in their entire lives. Through the CMC Program, I encourage presenters to forge a connection with community leaders to arrange for at least one community venture when I travel to their region to perform. Most frequently, the connection is made with a school, community center, or retirement community, and I travel to that location to give a highly interactive performance or demonstration. On occasion, it is also formed with a local business or corporation that could assist them in launching a program in their community, and I deliver a presentation to executives and employees to share with them the benefits of exposure to classical music and the need for programs in their community to provide this exposure. 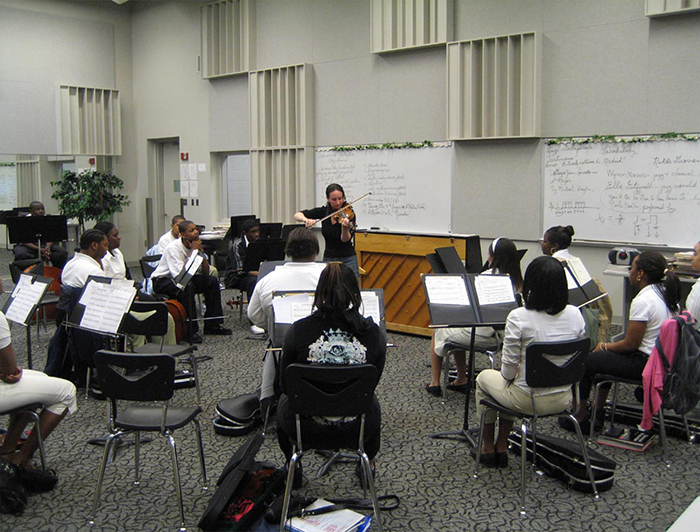 The CMC Program initiative has enabled me to reach students in the public school systems of Philadelphia, Birmingham, and gymfuls of students in other inner-city schools; to music schools in Colorado, Ohio, and Bogotá, Colombia, among others; to Lockheed Martin, the corporation responsible for crafting military vehicles; and dozens upon dozens of places in between. The relationships that have been formed by presenters with their community often prove to be far more productive than just the one or two sessions I present while there. In fact, some connections continue to be strengthened by new programs created by the presenters to continue to bring visiting artists, as well as local ones, to their community centers and schools. Copyright © 2017 Christina Castelli. All Rights Reserved.